The first time I met my brain was 15 years ago, when the doctor showed me MRI scans of a tumor that was growing in my head, causing me unbearable pain, and threatening my life. After a successful operation, I fully recovered and was back to normal. I soon forgot about my brain. Few years later, when I became responsible for the toughest project that I have ever managed, I experienced a different kind of pain. That pain led me to meet my brain for the second time. This time, the pain was from chronic fear, anxiety, and anger I was experiencing from my project that drove me deeper and deeper into despair. Desperate for a relief, I started reading about how the human brain creates fear, anxiety, and anger. Perhaps if I know how my brain creates pain, I may be able to stop it. Learning about how the brain works helped me see how and why I perceived things the way I did, what triggered my fear, anxiety and anger, and how I responded to them. Here I share with you what I learned and how it has saved me. The brain is the source of every thought, feeling, and behavior. The brain controls every bodily function through the central nervous system. One key concern that keeps your central nervous system awake is keeping you safe. Think of your Central Nervous system as an efficient “Survival Operating System” that has been fine-tuned, through thousands of years of evolution, to keep you alive and safe. But your “Survival Operating System” is not be optimized to deal with the intense and chronic anxiety, fear, and anger that are the occupational hazards of leading people in projects. Managing people can be extremely taxing on your system. Internally, you stress about whether you are doing your job or not, whether you are “in control” or not, what others may think of you when you feel like you are not “in charge”. This does nothing but increase your loss of control. The loss of control leads to stress, which in turn leads to anxiety, fear, and anger. All this does is rev up your nervous system. But you can’t lead anyone or learn to lead for that matter when your central nervous system is constantly on fire and out of control. Friedman and Forster suggest negative emotions, such as those associated with high levels of stress, tend to constrict the scope of attention. Negative emotions are triggered in order to signal danger and prepare the body for fight or flight. Cacioppo, Berntson, & Crites found that stress can narrow the scope of perceptual attention. In other words, stress causes the brain to “miss the forest for the trees. All in all, you are not you when you are under chronic stress. Learning about the brain gave me a language to help me understand my mental experiences as they happen, especially when I am in intense situations and need to think with clarity and focus. Learning to calm down my central nervous system helps me see a wide range of options in how I might want to respond to different situations on my projects. I am able to slow down long enough to determine the right way to respond with confidence, clarity, and intent in a way that is aligned with my goals. This skill is not just important for developing our leadership competencies but also for protecting us from physical and psychological wear-and-tear and burnout – otherwise known as the greatest hits of chronic stress. My learning journey continues. While I remain “work in progress”, with every project I get a chance to evolve into a better version me. Project Management taught me that the most important skill in life is the capacity to learn. I get the opportunity to deal with new people, new experience, and new challenges. And with each challenge, I get to test how low or high my ceiling of complexity is. That is how much ambiguity and uncertainty my central nervous system can cope with, before I feel loss of control. I get to learn about who I am and what I am capable of. But more importantly, with every project I get to learn how to continue to raise the ceiling. This is what Project Management means to me. P.S. This post is published as part of a first ever project management related global blogging initiative to publish a post on a common theme at exactly the same time. Seventy Six (76!) bloggers from Australia, Canada, Colombia, Denmark, France, Italy, Mexico, New Zealand, Poland, Portugal, Singapore, South Africa, Spain, UK and the USA have committed to make a blogging contribution and the fruit of their labor is now (literally NOW) available all over the web. The complete list of all participating blogs is found here so please go and check them out! Thank you so much Stephen. I appreciate your feedback. Samad, this is one of the best posts of the PM FlashBlog event. Your story puts in perspective things about our humanity that most of us never even acknowledge. Thanks for your insights, your friendship, and for sharing all that you’ve learned over the years. Thank you so much for your kind words and for your friendship. I am catching up with the other blog posts and your is on top of my list. I certainly enjoyed the picture of your little princess. I love how she looked so comfortable with her little hands on the keyboard talking to grandpa on Skype. What a sweetie!! thank you for sharing. Samad, I did not know you had to deal with this health issue, and I’m grateful you pulled through. We in the PM community certainly enjoy your brain. Thanks for the honest and thoughtful post! Thank you so much for your kind words and for all your support. I am truly impressed with the work you are doing on your podcast and the thriving community you have created. I look forward to our collaboration. thank you again. Thanks Samad. Know that you are welcome as a guest on my show anytime. Just say the word. This is a real story of how we balance our lives as PMs to thrive personally and professionally. At the end of the day; you must take care of yourself to lead others. Your journey in PM has lead to your discovery of studies in the human condition and how our brains process everything we see and do. It’s one of my favorite posts so far. Be well; let’s chat again soon. Thank you so much Naomi for the kind words. I appreciate your friendship and I look forward to more future collaborations with you. You are awesome!!! Really thanks for sharing your honest and personal experience and view. Thank you so much Henny. I loved your post on the ideal project manager. It was the most innovative and creative way to describe the various hats we have to put on that I have ever seen. I just left you a comment. Thank you again. Hi Samad, thanks for taking part in the #pmFlashBlog initiative and for providing this excellent and intimate insight into intimate aspects of your life. As I make my way through the 69 published posts I try and find the gem in each, that piece of advice or observation worth taking home. Well said mate and I wish you all the very best. Thank you so much Shim for the thoughtful comment and for taking the time to write. It is an honor to be invited to participate in this wonderful event. I had a rough week this week going live with one of the biggest project I have undertaken so far in my career. Having to reflect on what project management meant to me, as you asked us to do, put all the challenges I faced in perspective and made them all seem manageable as each challenge was a learning opportunity. 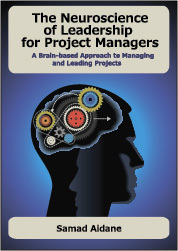 Samad, I totally agree that neuroscience can be helpful for managers in many different ways. Some may think that it’s some “rocket science”, but there are good reads that make it quite easy to understand. For instance, David Rock’s Brain at Work is awesome. I think that understanding how the brain is “wired” is valuable not only for your personal performance and productivity, but also for managing your team efficiently. Say, if some new method doesn’t get adopted, you understand the deeper reasons of this and can figure out the ways to make it easier. and also thanks naomi to tells more about this.